(Nanowerk News) The lotus effect has inspired many types of liquid repelling surfaces, but tiny water droplets stick to lotus leaf structures. Now, researchers at Penn State have developed the first nano/micro-textured highly slippery surfaces able to outperform lotus leaf-inspired liquid repellent coatings, particularly in situations where the water is in the form of vapor or tiny droplets. 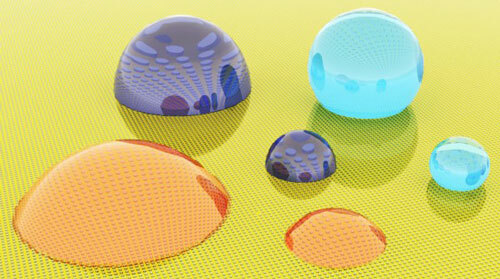 Enhancing the mobility of liquid droplets on rough surfaces has applications ranging from condensation heat transfer for heat exchangers in power plants to more efficient water harvesting in arid regions where collecting fog droplets on coated meshes provides drinking water and irrigation for agriculture to the prevention of icing and frosting on aircraft wings. Liquid droplets on rough surfaces come in one of two states, Cassie, in which the liquid partially floats on a layer of air or gas, and Wenzel, in which the droplets are in full contact with the surface, trapping or pinning them. The Wenzel equation was published in 1936 in one of the most highly cited papers in the field; yet until now, it has been extremely challenging to precisely verify the equation experimentally. “Through careful, systematic analysis, we found that the Wenzel equation does not apply for highly wetting liquids,” said Birgitt Boschitsch Stogin, a graduate student in Wong’s group and coauthor on a paper titled “Slippery Wenzel State”, published in the August 28 online edition of the journal ACS Nano. “Droplets on conventional rough surfaces are mobile in the Cassie state and pinned in the Wenzel state. The sticky Wenzel state results in many problems in condensation heat transfer, water harvesting and ice removal. Our idea is to solve these problems by enabling Wenzel state droplets to be mobile,” said Xianming Dai, a postdoctoral scholar in Wong’s group and the lead author on the ACS Nano paper. In the last decade, tremendous efforts have been devoted to designing rough surfaces that prevent the Cassie-to-Wenzel wetting transition. 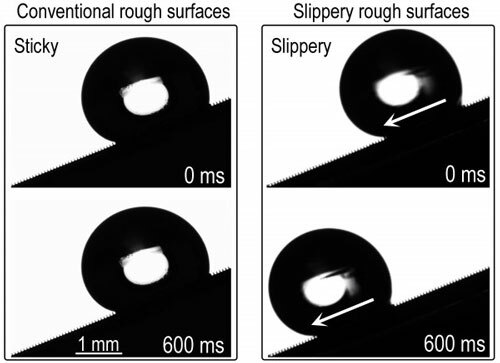 A key conceptual advance in the current study is that both Cassie and Wenzel state droplets can retain mobility on the slippery rough surface, foregoing the difficult process of preventing the wetting transition. In order to make Wenzel state droplets mobile, the researchers etched micrometer scale pillars into a silicon surface using photolithography and deep reactive-ion etching, and then created nanoscale textures on the pillars by wet etching. They then infused the nanotextures with a layer of lubricant that completely coated the nanostructures, resulting in greatly reduced pinning of the droplets. The nanostructures also greatly enhanced lubricant retention compared to the microstructured surface alone. The same design principle can be easily extended to other materials beyond silicon, such as metals, glass, ceramics and plastics. The authors believe this work will open the search for a new, unified model of wetting physics that explains wetting phenomena on rough surfaces such as theirs.